Have you ever filled out a “quick application” to be considered for something? Maybe your car dealership requires a “quick application for approval,” or a side gig requests a “quick application for employment.” Then, you come to find out you need to submit sixteen personal and professional references, thirty-seven years of credit history, and a notarized copy of your middle school report card. Applying to a graduate program shouldn’t be quick and easy, but it also shouldn’t feel like a thorn in your side. AOEU’s Master of Arts in Art Education is a rigorous and engaging program, and we designed the application to reflect that. Along the way, your Admissions Counselor will be there to support you as little or as much as you need. The application is both meaningful and reflective of your work as an art educator. Best of all, the application is designed to be user-friendly and easy to navigate (and if you get stuck, we created some documents to support you!). Follow the four tips below, and you’ll have everything you need to put your best foot forward. Click through the online application. Determine what you already have. Set a series of small goals. Use these questions to determine your application timeline. Have you had your official transcripts sent to AOEU? When do you want your application to be officially under review? When do you want to start your degree? When do you want to start taking courses? Let’s take a look at each component. Use the 3 Ps as your guide to reviewing your application. Sure, preparation might go unsaid, but it’s critical in understanding the big picture. AOEU’s application is a multi-modal process, so preparing will help you put together a cohesive application submission. But, what does preparing actually look like? You can see everything before you even get started, and you don’t even have to work through it in order! Take a few minutes to get acclimated with the application format and directions. Already have a classroom Instagram? You might have everything you need for the micro-portfolio. Just updated your resume? Look it over to ensure you’ve included your most recent experience, and then check it off the list. 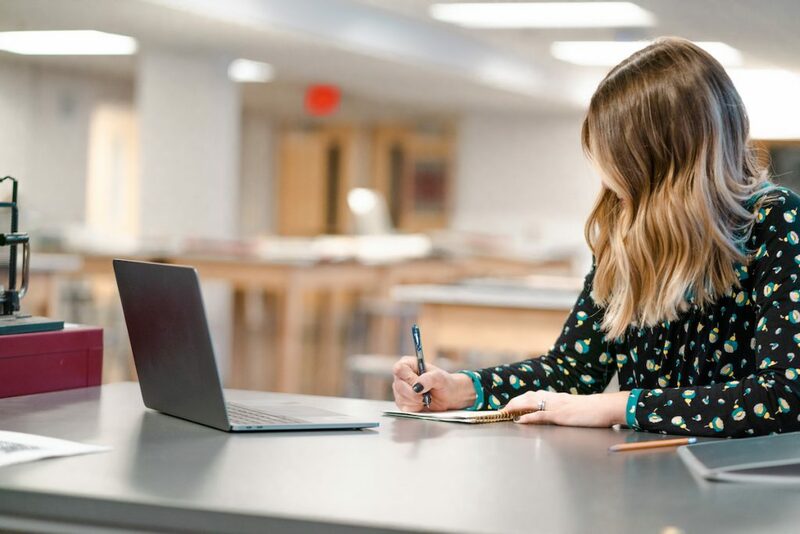 Applying might seem like a big goal to tackle all at once, but determining a topic for your writing sample is something you might be able to do between classes. Break down the goal of “applying” into several smaller tasks. What are your goals? Why do you want to earn a master’s degree? What do you want your application to communicate about you? Our review team wants to understand you as a professional, but we also want to see your personality! Don’t overthink things, and be yourself! We’ve created this handy checklist to help get you started. Download your copy below. Once you feel like you have a grasp on the big picture plans, you can take action on the next step, which is determining due dates. When you work with your admissions counselor, they’ll ask you questions about your timeline for applying. 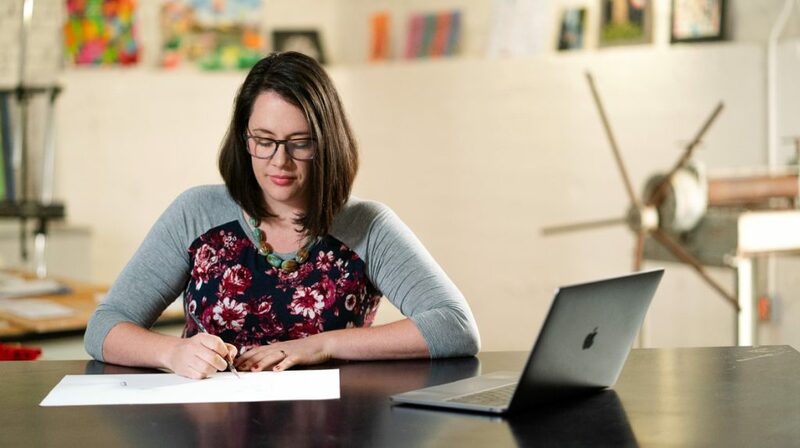 This is the best way to determine your own due dates for the application process. Since you can apply at any time, it may be difficult to hold yourself accountable. Start by setting due dates for each component on the Application Checklist. All institutions are different, so make sure you start early. Your official transcripts need to document an earned BA degree or higher. Electronic transcripts are sent almost instantly and should be reflected on your account within a few days. Mailed transcripts take a bit longer, generally between one to three weeks. Learn more about sending your transcripts here. 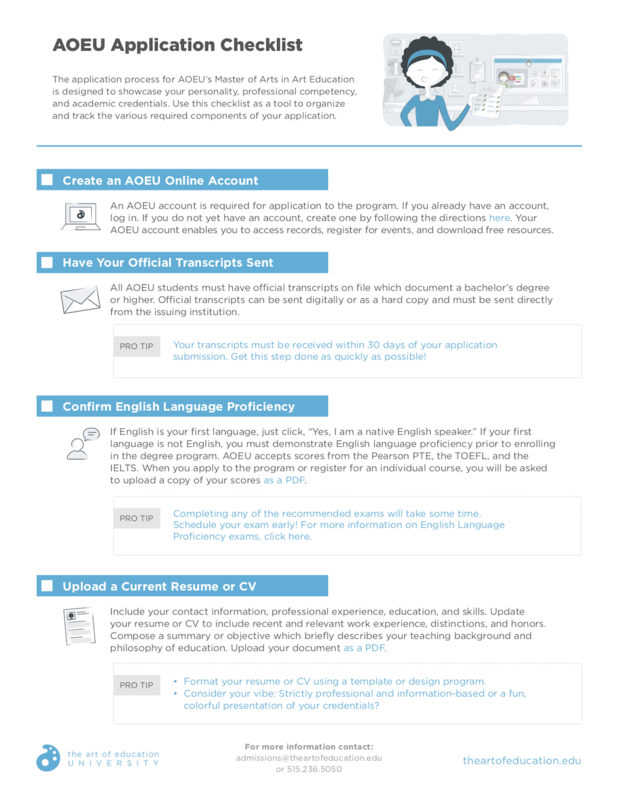 Once AOEU has your official transcripts and completed application, you’ll hear back from us within seven days. We recommend you get your application in by the 20th of the month prior to when you’d like to begin the program. So, if you want to start on June 1, plan to have your application and official transcripts in by May 20th. You can begin an AOEU course before submitting your application. Actually, you can take a few! If you’re ready to jump in, take your courses for graduate credit and earn an 80% or higher. Then, if you are accepted to the program, up to eighteen previously completed AOEU credits automatically transfer into your degree. Your resume or CV should include your education, work experience, and any unique distinctions or honors. If you’ve never written a resume or it’s been a while since you updated yours, no worries. Use this as an opportunity to showcase what you’ve been working on in your teaching practice! No recent work experience? Showcase professional development and any related volunteer or work experience. You can download a helpful guide right here. Making a video makes a lot of people nervous, but don’t worry. This is the best place for application reviewers to get to know you! Consider filming in your classroom or other art space. Use your one to three minutes to introduce yourself and outline your goals for earning a master’s degree. Speak slowly and clearly, and balance your personality and professionalism. Download a list of tips right here. The writing sample is the best opportunity for you to showcase your academic competency. It should be a professional and polished response to one of the four prompts: an artist statement, your philosophy of teaching, a reflection on your personal history with art, or a persuasive essay on the importance of art education. Support your thoughts with outside resources to meet the APA requirements! Art teachers are visual people. What better way to showcase yourself and your teaching than a collection of visuals? Consider a variety of images showing anything related to art or art education: student work, your own artwork, images of your classroom space, art displays, etc. Anything you might post on a classroom Instagram could be a good option! Write a short caption for each image, so reviewers understand what they’re viewing. Download more tips for creating a stellar micro-portfolio right here. Reviewing your application is the most important thing you can do. Before you press submit, ensure everything you’ve submitted shows you in the best light. Your application should be a professional representation of yourself. Your writing should be proofread and have no errors in spelling or grammar. The images in your micro-portfolio should be clear, well-lit, and have descriptive captions. 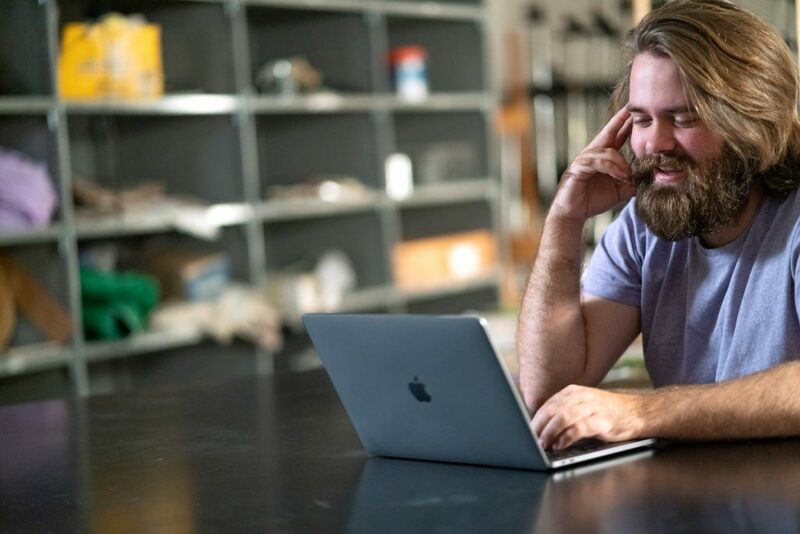 In your video of intent, make sure you’ve shown confidence and clearly outlined your professional goals for wanting to earn your master’s degree through The Art of Education University. Art teachers are the best advocates. We’re constantly advocating for the arts, for our students, for our supply budgets, and more. Use your application as an opportunity to show what you’re really passionate about, what you advocate for. Consider it a platform where you advocate for your own professional learning, finding opportunities to convince application reviewers you are an excellent fit for AOEU’s program. Use the application to showcase your personality and what makes you unique! Film your video of intent in your classroom, art studio, or another bright and creative space. Add a pop of your favorite color to your resume. Use the images in your micro-portfolio to tell your visual story as both artist and educator. I’ve said it before, and I’ll say it again; be yourself! Although applying to a master’s degree program can sound daunting, it doesn’t need to be. Use the helpful tips outlined here along with the downloads to guide yourself in the process. Don’t forget, you’ll have your Admissions Counselor there to help! Are you thinking about applying? Use the buttons below to get started! Have you started your application to AOEU? What questions do you have about the application process? The post How to Create the Best AOEU Application Possible appeared first on The Art of Education University.